The official WooCommerce for Android App is now available for free from the Google Play Store via WooCommerce.app. 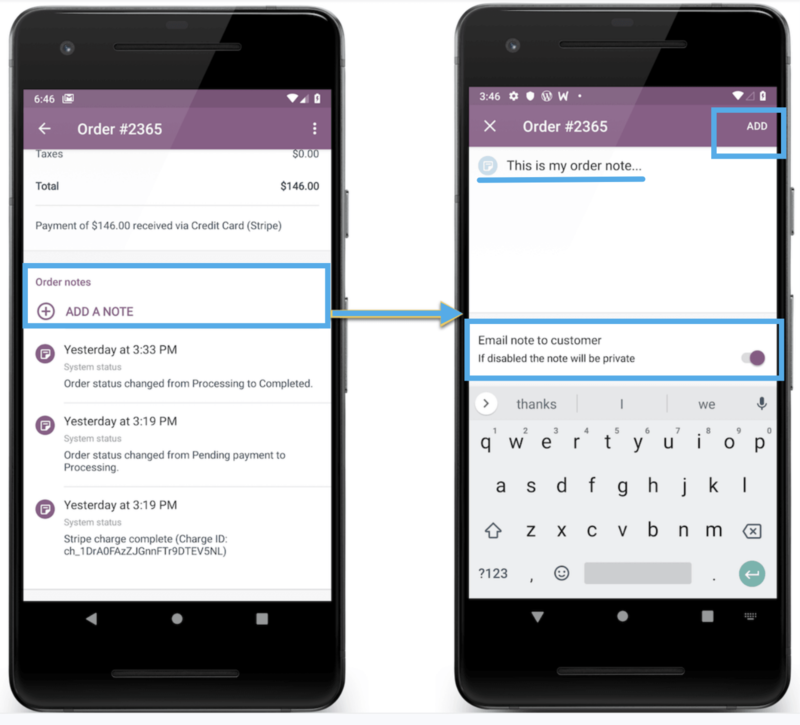 This guide walks you through setup, including how to connect your store and how to use the app. 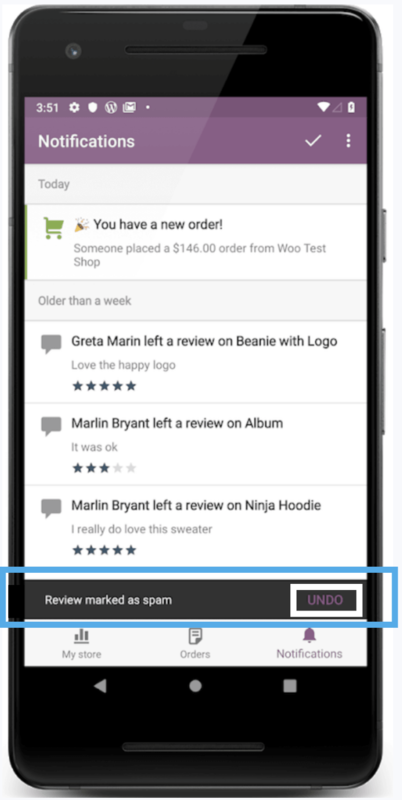 Use your device to visit the Google Play Store, search for WooCommerce by Automattic, and download. 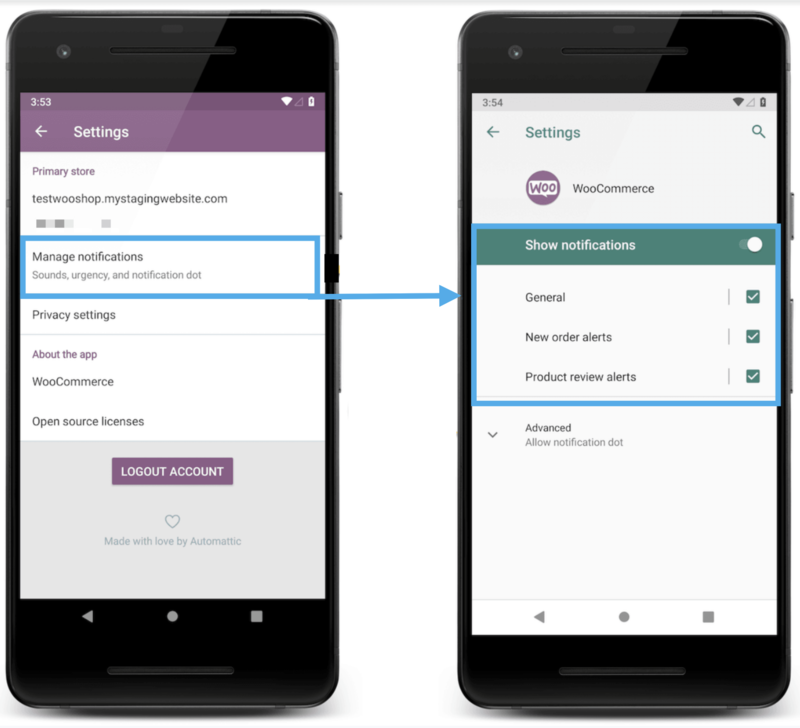 WooCommerce Android supports several methods for logging in, after which you can select a store to connect to the app. Select LOG IN WITH JETPACK. This takes you to the Login screen. 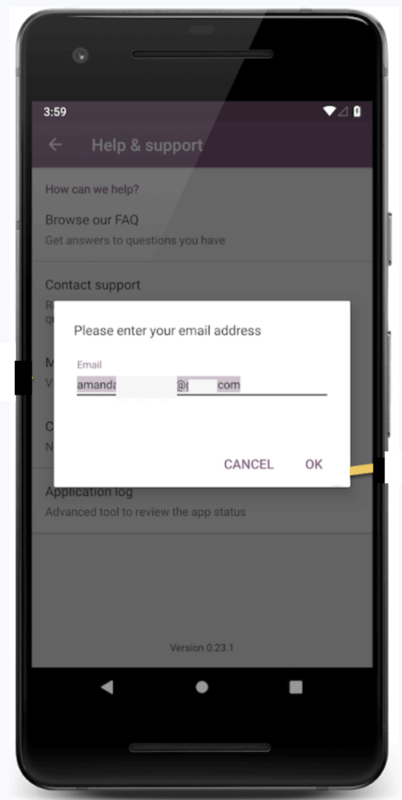 Select a method to log in: Email Address, Google, or Site Address (all option covered in next sections). Enter the email address associated with your WordPress.com account. Note: WordPress.com and Jetpack are connected. NEXT. The Magic Link screen will appear. Select whether to use Magic Link or enter your password. 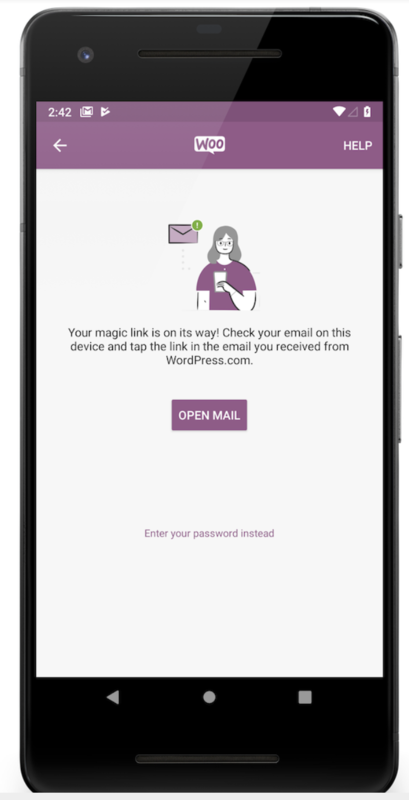 Magic Link sends an email with a link to complete the login experience without entering a password. Select SEND LINK to use Magic Link. Another screen displays with prompts you to tap OPEN EMAIL to be routed to your email app. 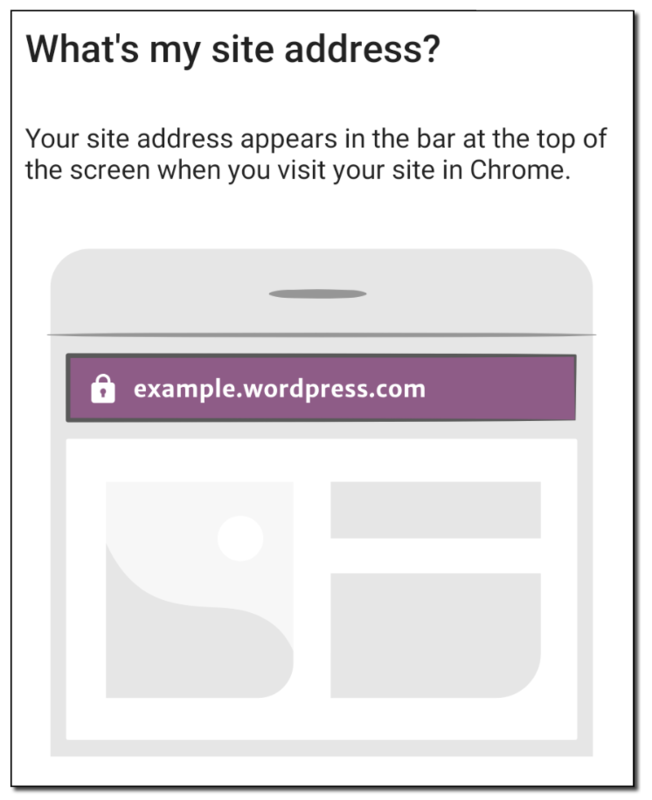 Locate the email containing a link to open the app, and tap the link to continue. Tap Enter your password instead to skip Magic Link. The Enter Password screen appears. 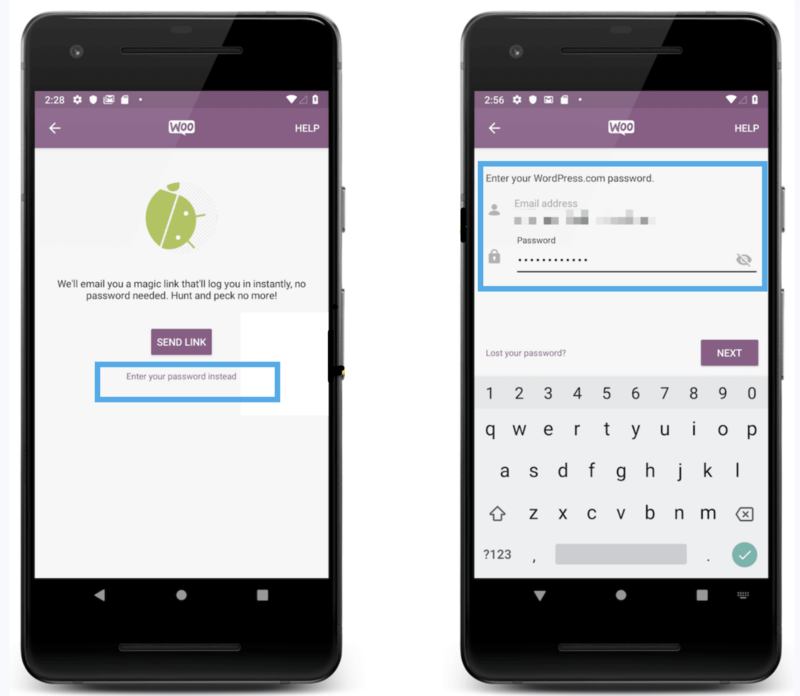 Type your password, and tap NEXT to finish the authentication process. If login is successful, the Store Selector screen will appear. Go to the Select a Store section below. Select Log In with Google. Select Log in by entering your site address. NEXT. A Site Login screen will appear. 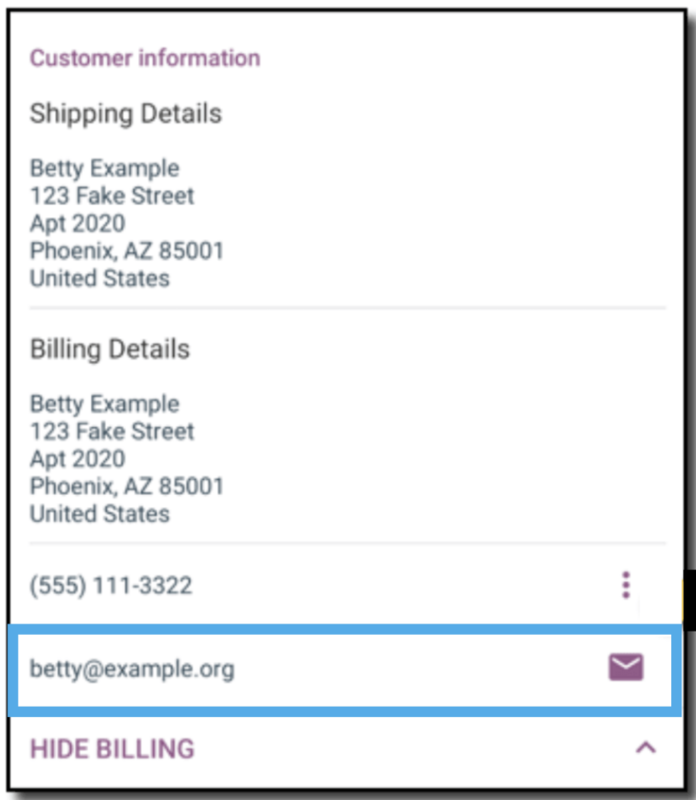 Enter the Site Address of your WooCommerce store. For example: mystore.wordpress.com or mystore.com. NEXT. The Username Login screen appears. Open the upper-right hamburger menu on the toolbar. A drop-down menu will appear. Select Settings. The Settings screen will appear. Select LOG OUT ACCOUNT. A confirmation box will appear. If logout is successful, the app loads the Welcome screen. Select a store from the list of options if there is more than one. A store will be selected automatically if it is the only option. Multiple stores vs. one store. The Main screen appears when your account is authenticated and your store is connected. 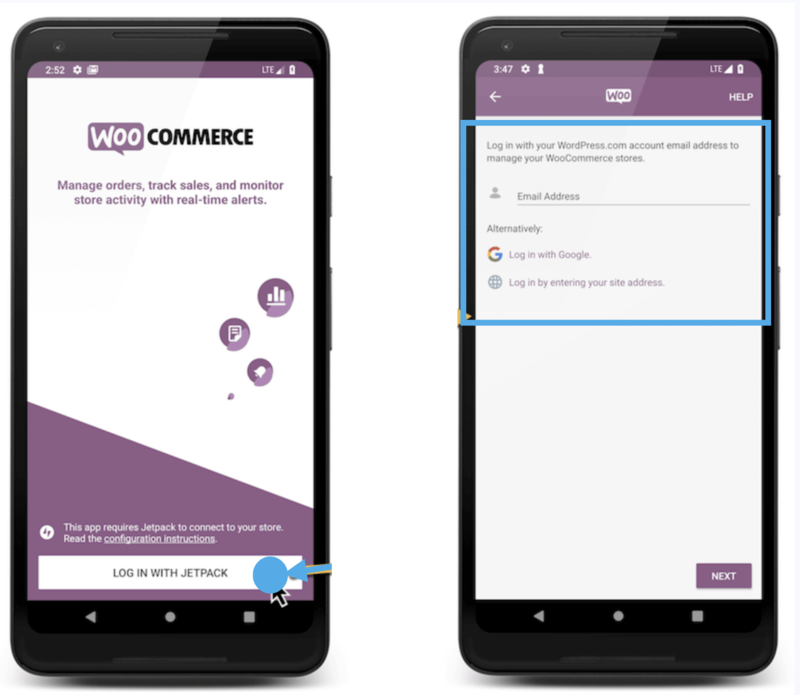 At this time, it is not possible to simultaneously manage multiple WooCommerce stores using the WooCommerce Android app. Log out of a store, if logged in, by following steps in the Log Out of Your Store section above. 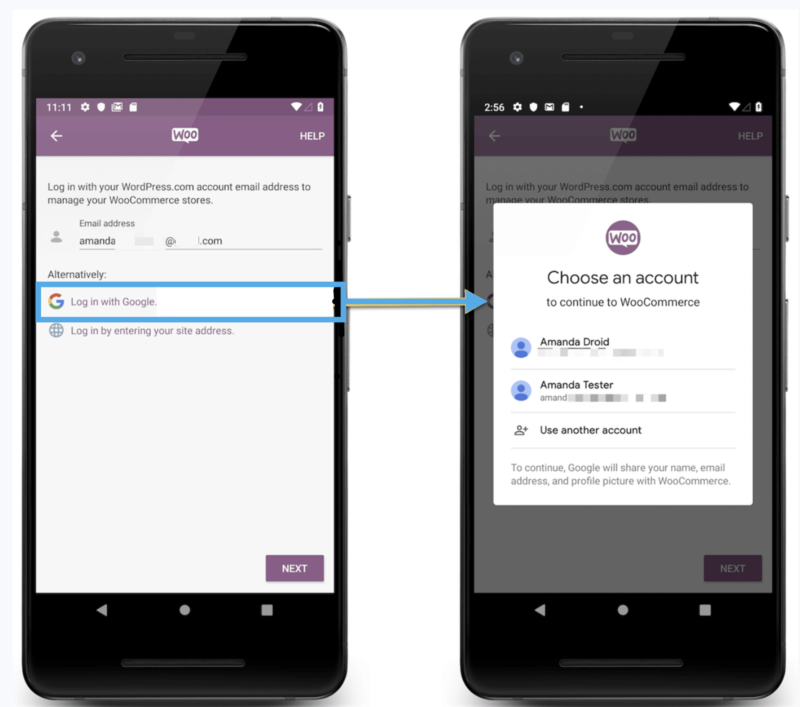 Repeat steps from the Connect store to Android app section. Select the appropriate store from the Store Selector screen. 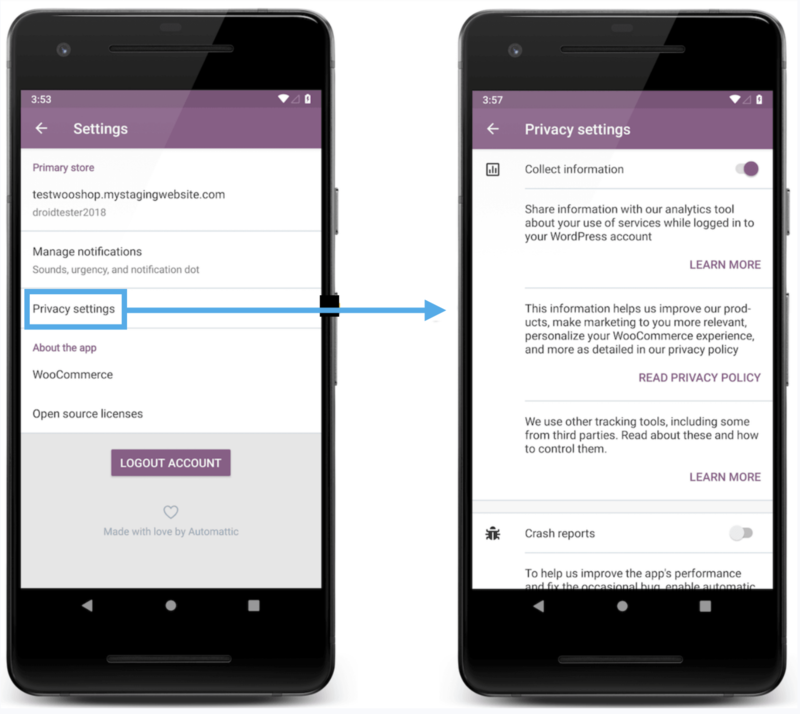 Settings – Management of privacy, notifications, and logout. Help – FAQs and the option to contact one of our Happiness Engineers. 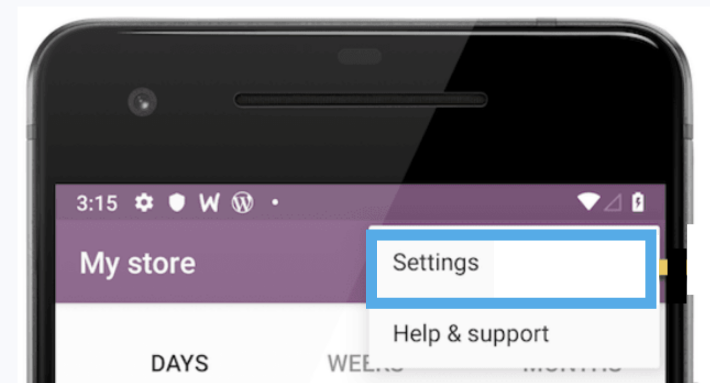 On the top toolbar is a hamburger menu with drop-down for Settings and Help & Support. 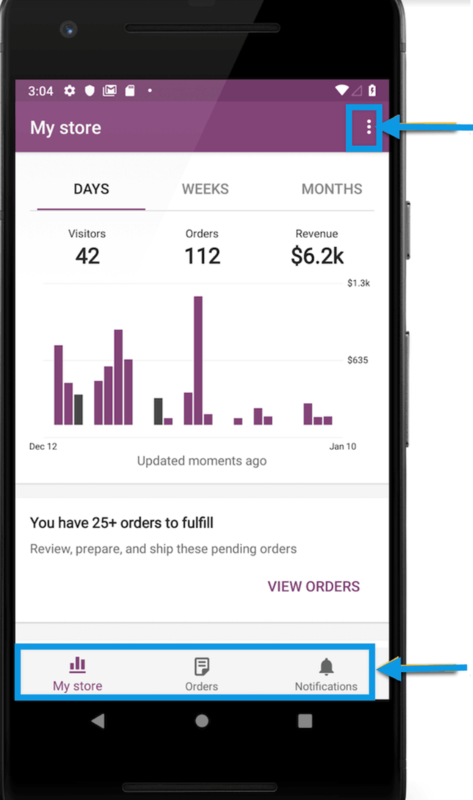 Use the WooCommerce Android app to track data, interact with orders and customers, and be notified of new orders and reviews. 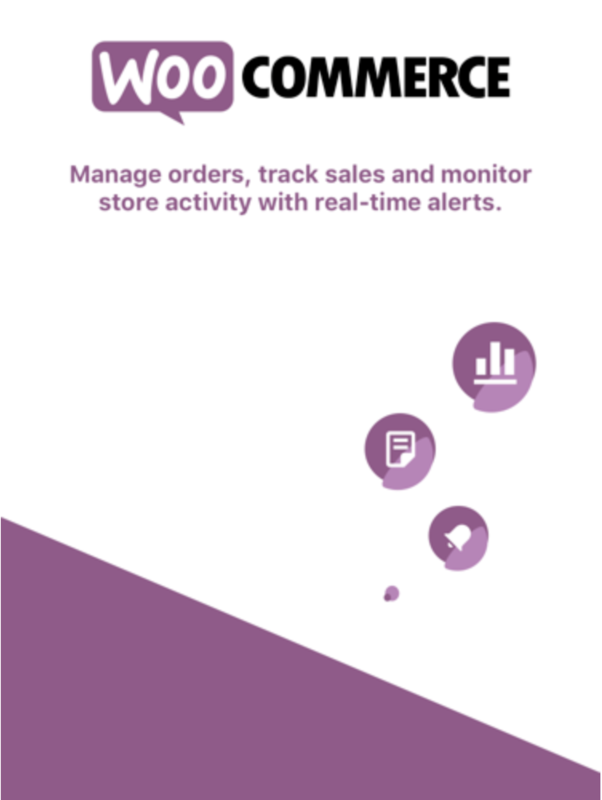 The My Store tab provides sales and visitor data, alerts you to pending orders, and gives insight on sales trends. The middle section only appears when there are pending orders waiting to be fulfilled. 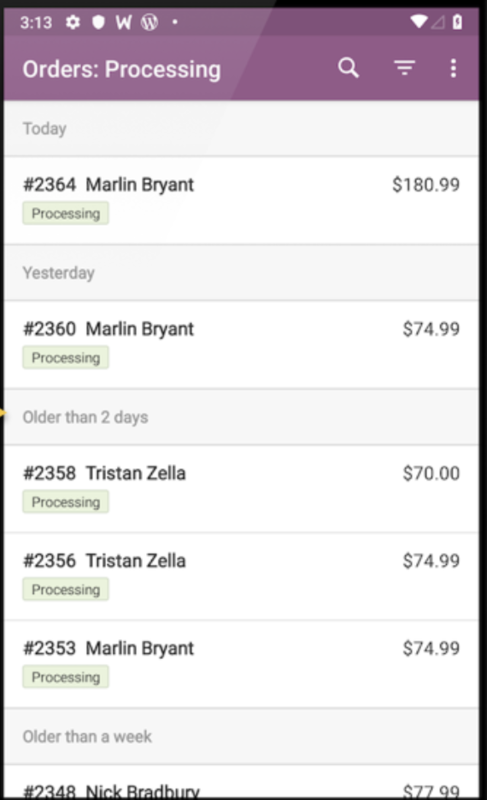 More info on order statuses at: Managing Orders. 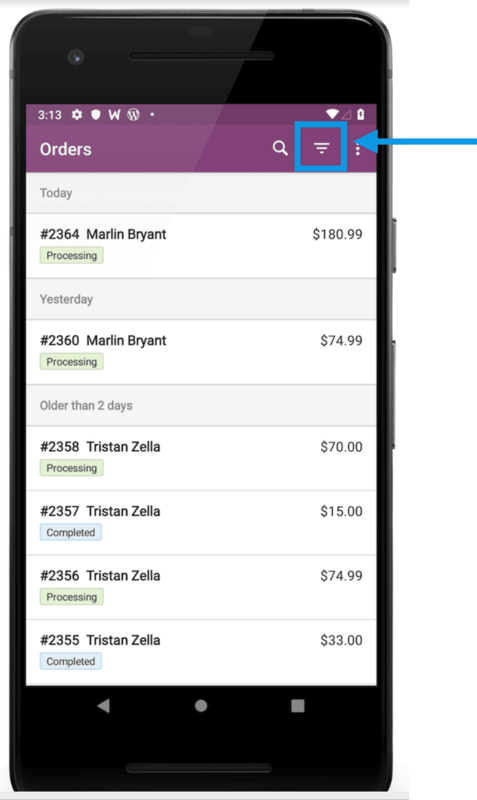 Tap VIEW ORDERS to go directly to the Orders screen that displays all pending orders with Processing status. The My Store tab updates each time you open the app. Or pull down the entire screen to manually refresh as needed. Auto-refresh is planned for the future. 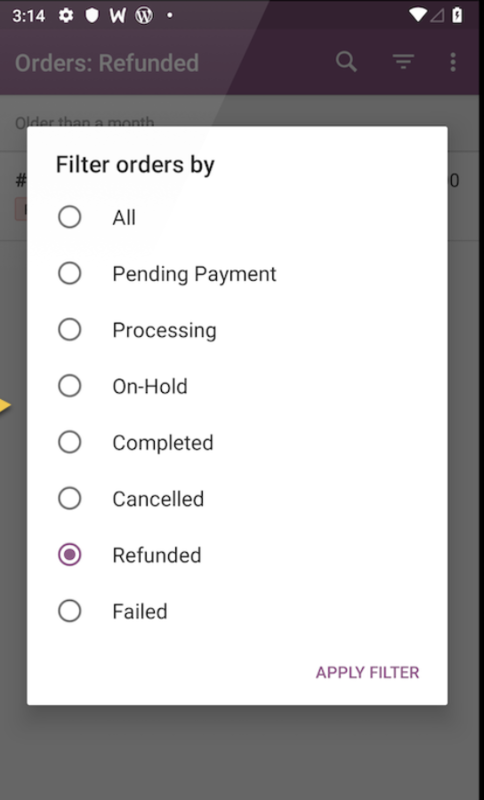 Select an order status to filter by: Pending Payment, Processing, On Hold, Completed, Canceled, Refunded, or Failed. Tap the Search icon on the top toolbar. Begin typing. The search will look for matching terms by first name, last name, products, and order number. 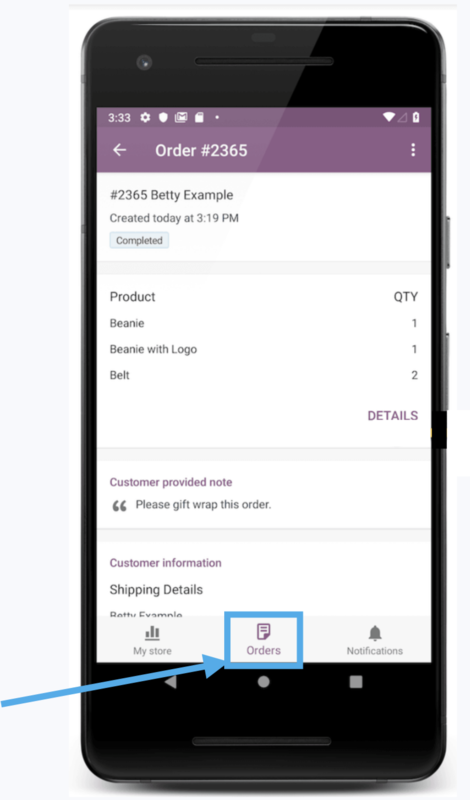 You can manage orders from the Order Detail screen, which is accessed by tapping an individual order. 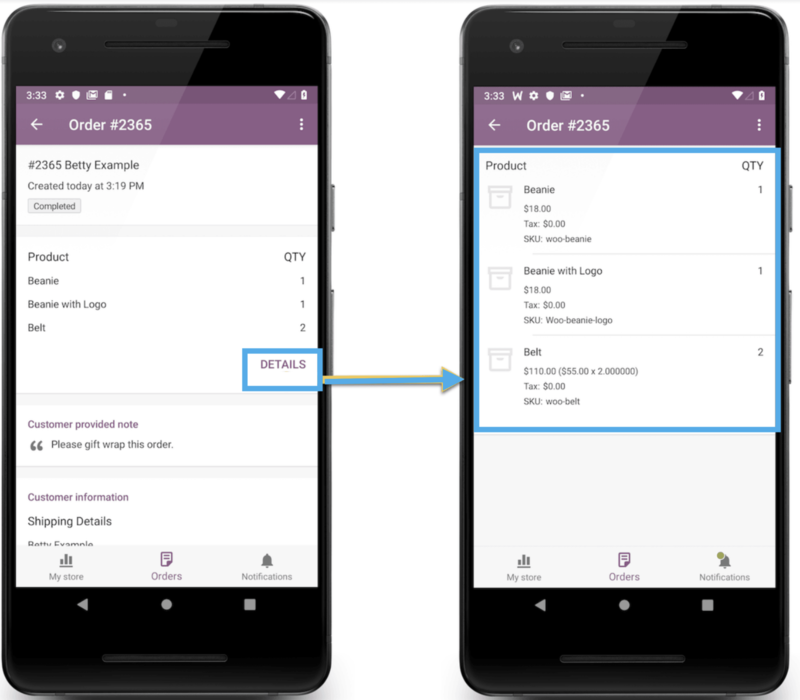 Verify the product details and shipping information, then MARK ORDER COMPLETE to finish fulfilling the order. Made a mistake? 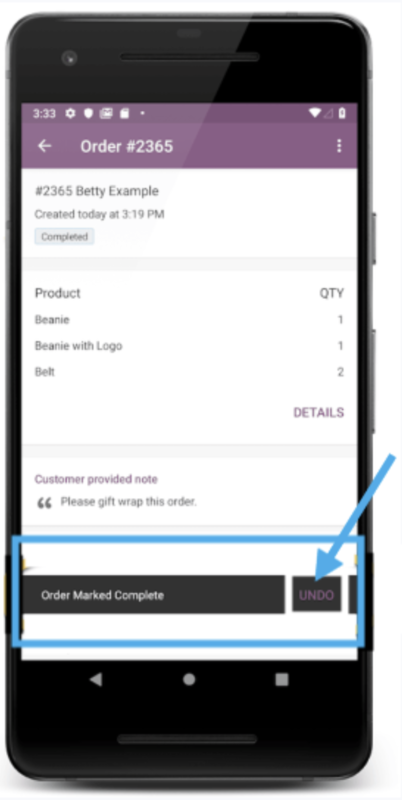 Upon submitting the order for fulfillment, a message with an option to undo will appear for short time. Clicking UNDO will revert the order back to its original status. 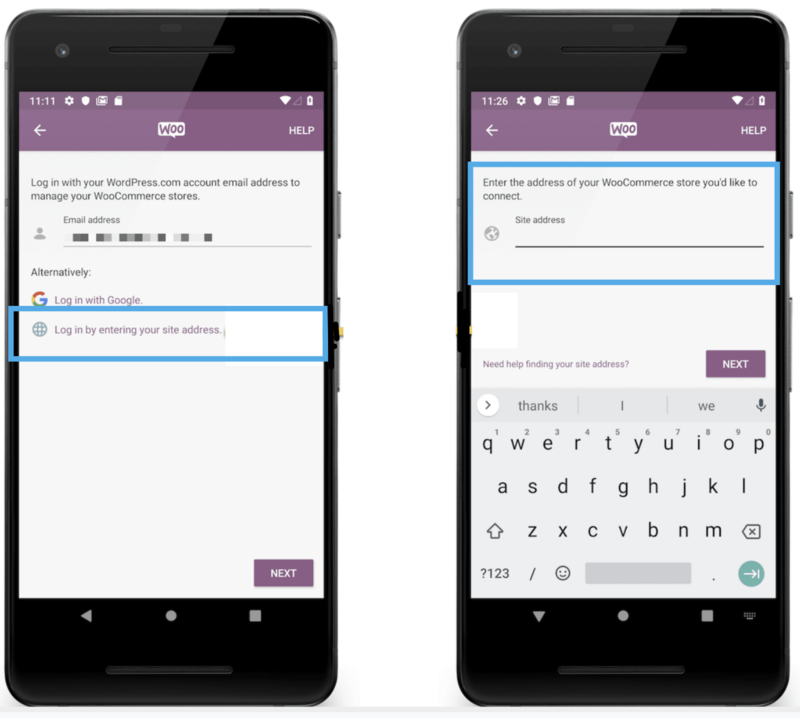 Send a text message by opening the hamburger menu and selecting Message. This option is only available if a valid phone number is entered during checkout. The app sends a text message to all numbers, but the attempt is only successful if is a mobile number. 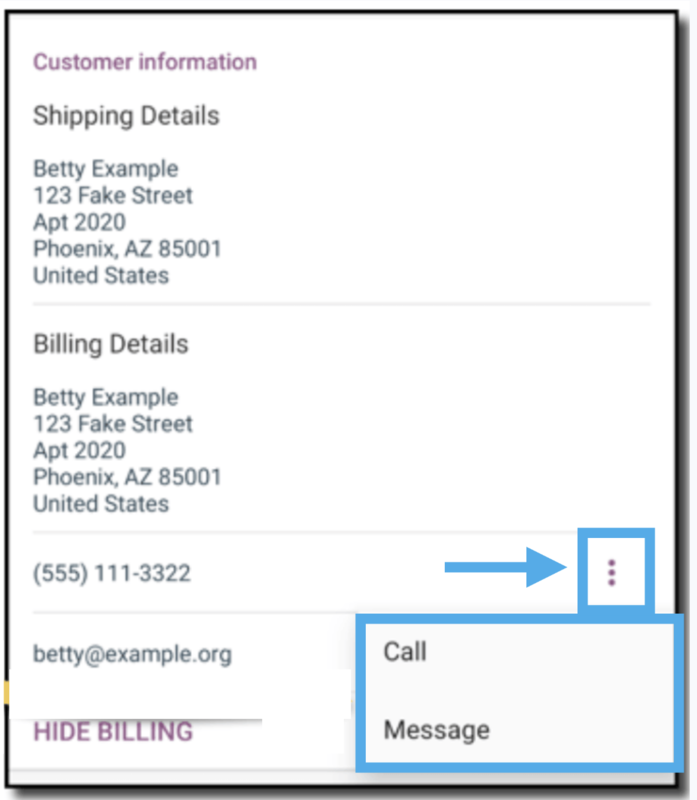 Call the customer by opening the hamburger menu and selecting Call. This option is only available if a valid phone number is entered during checkout. 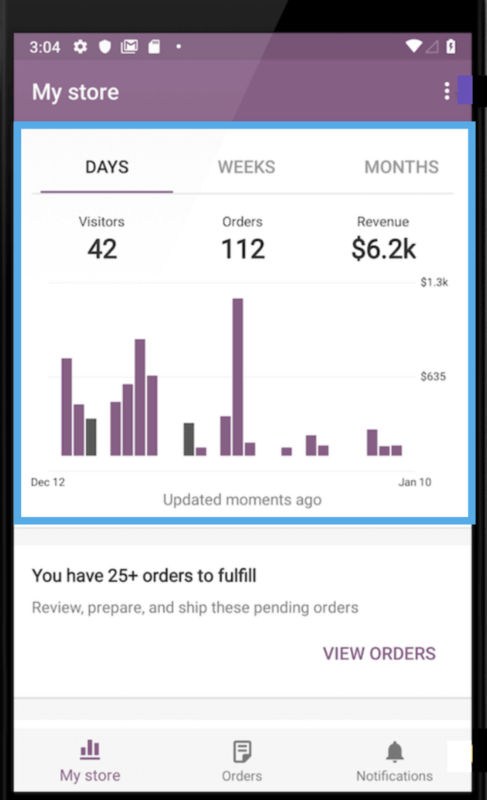 The My Orders tab updates each time you open the app. Or pull down the entire screen to manually refresh as needed. New Order – a new order was received. Tap the notification to open it in the Order Detail screen. More info in Orders section above. Product Review – a new product review has been submitted. Tap the notification to open it in the Review Moderation screen. More info in the next section. A red dot appears above the Notifications icon when you have a new notification. Note: Only the latest New Order notification is currently visible on the Notifications screen. To view all new orders, go to the Orders tab. Configure which notifications to receive in Notification Settings, including the custom Cha-ching! 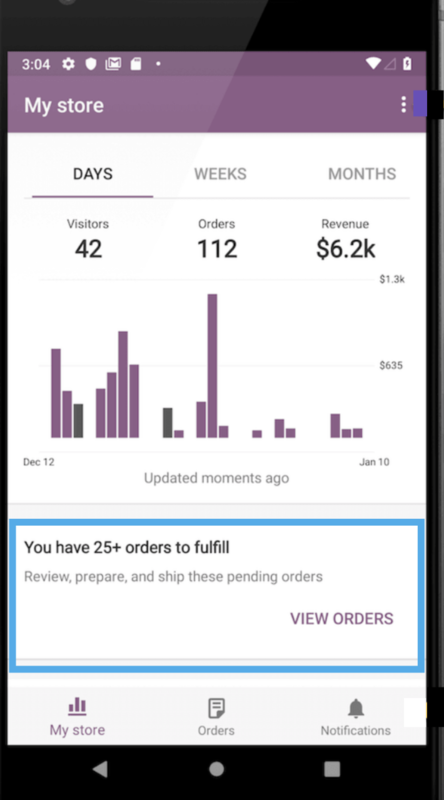 alert for new orders, which comes packaged with WooCommerce Android. Open the hamburger menu, and select Settings. The Settings screen will appear. Disable or enable alerts, as you wish. 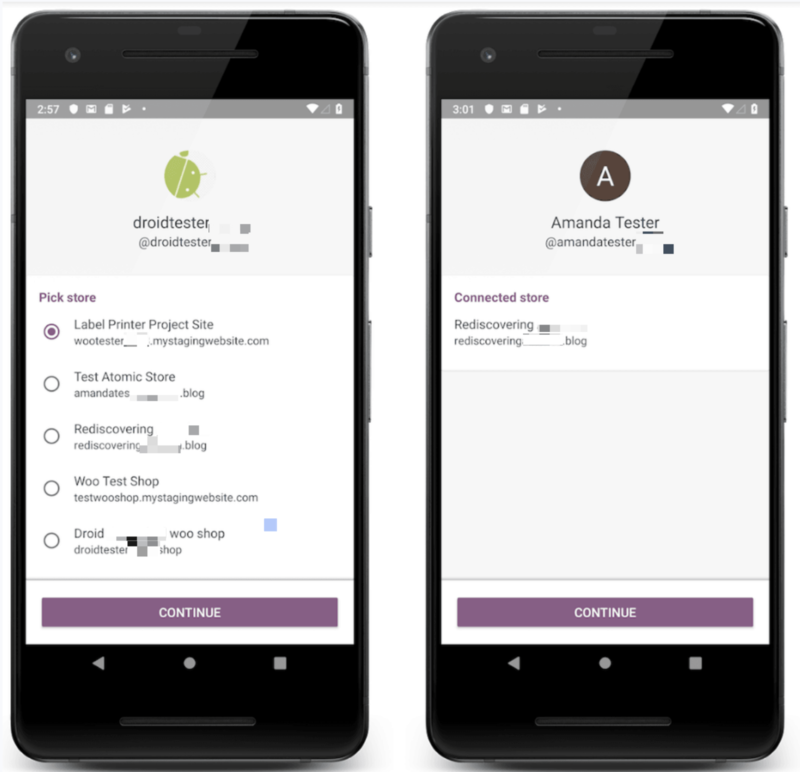 Options will appear differently depending on which version of Android your device is running. Android Oreo or later > Tap Manage Notifications to open the system channel settings. Android Nougat or earlier > Configure all three settings in the Notifications section. 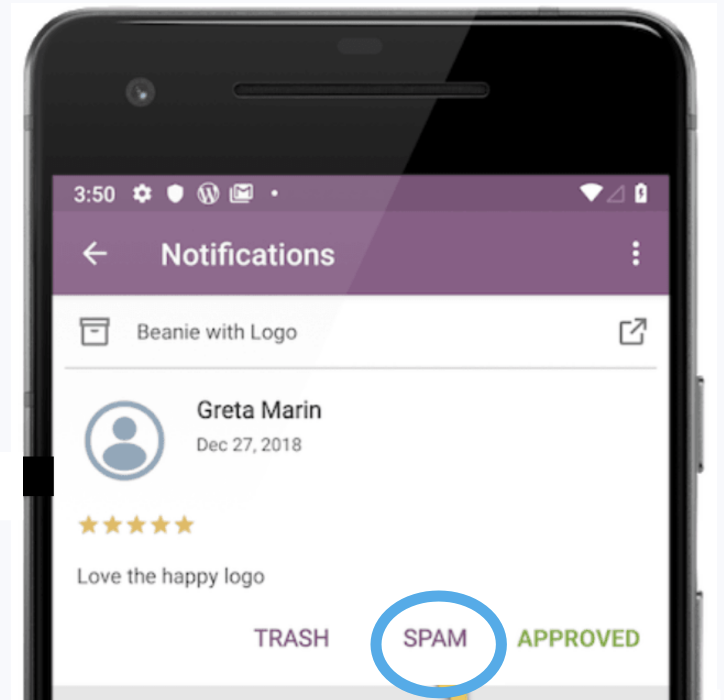 Note: Disabling a new order or product review notification will only prevent the alerts on your phone. 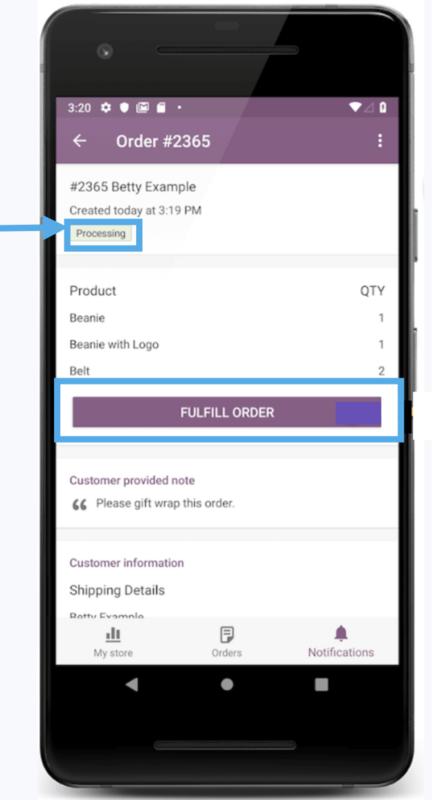 The Notifications tab within the WooCommerce app will display all notifications regardless of alert settings. Settings is also where you log out of the app, as previously explained in the Log Out of Your Store section. 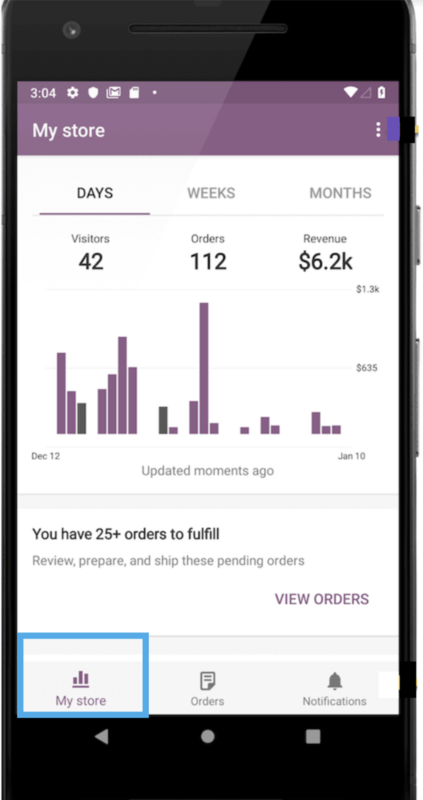 Find helpful resources or get in touch with one of our Happiness Engineers directly from the WooCommerce Android app. 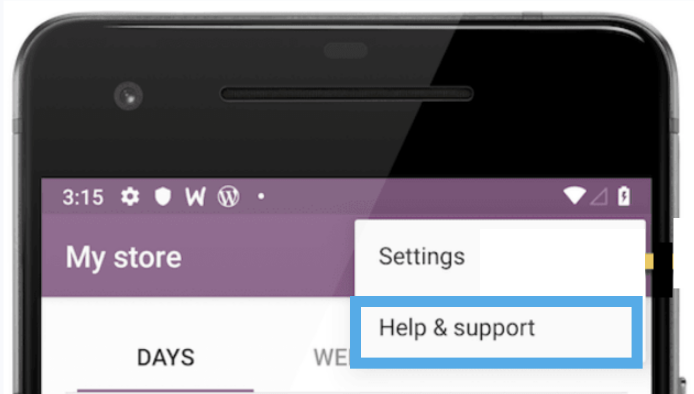 Open the hamburger menu, and select Help & Support. The Help & Support screen will appear. View, copy, and share the Application Log. Helpful for troubleshooting. Enter the email address for the associated store. Type your message, and send to our Support team. Select the ticket you wish to view. Tap Application Log. The Application Log screen will appear. 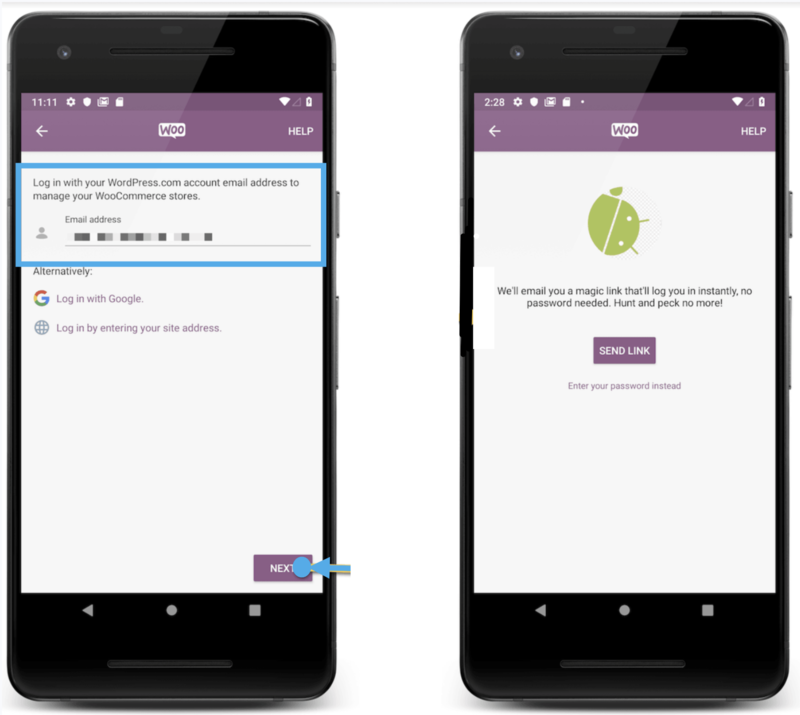 Copy: Tap the Copy icon, which will copy the log to the device clipboard, preparing you to paste the log into an application of your choice. Share: Tap the Share icon, which will open a list of applications installed on your device that support sharing text. Verify that your WordPress site has WooCommerce 3.5 or higher installed and Jetpack connected. A hamburger menu has three stacked dots or three stacked lines on a toolbar that open and expand to reveal more options. 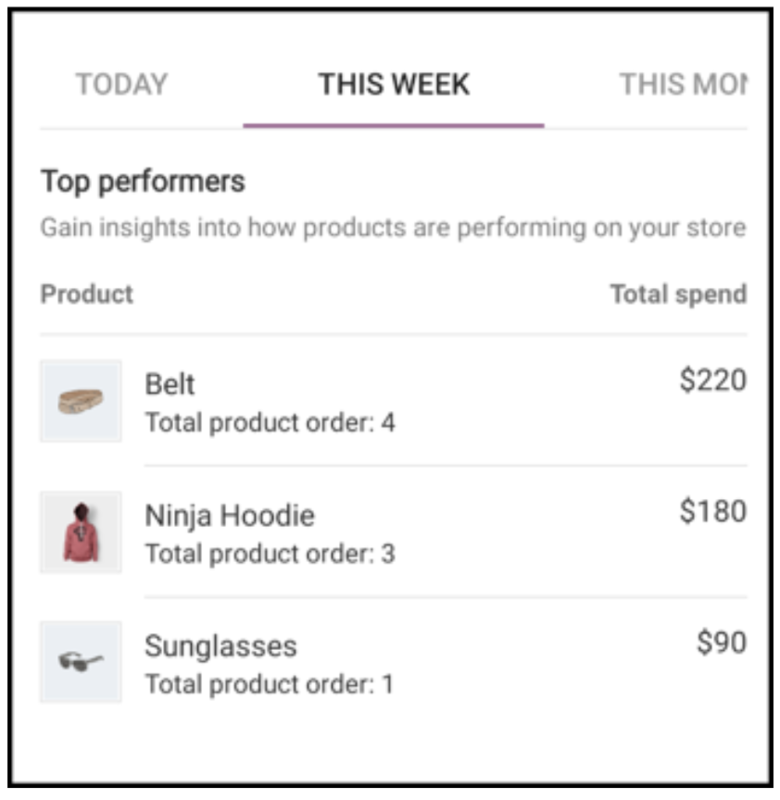 The WooCommerce Android app is brand new and actively under development. 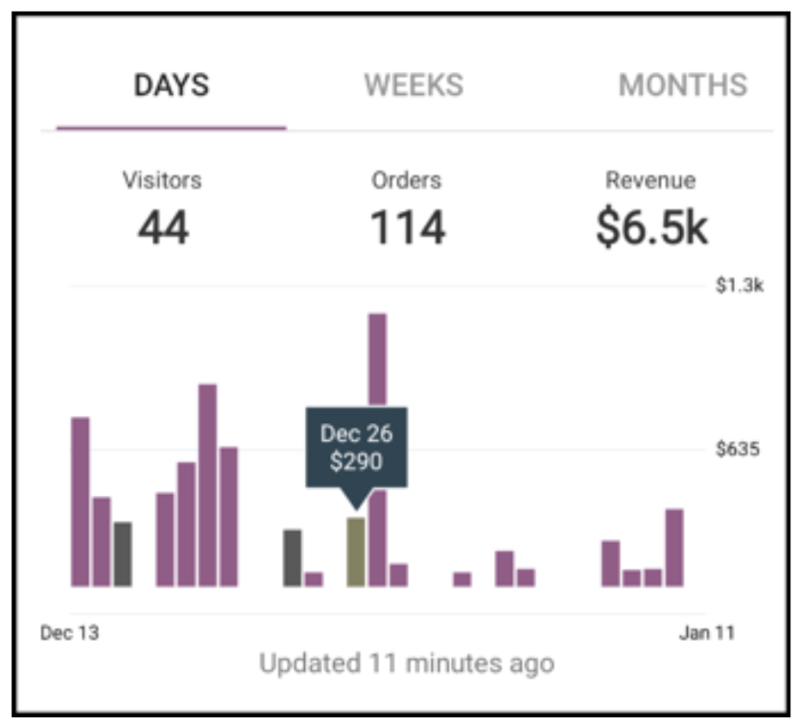 Developers at Automattic have lots of features on the Roadmap and are excited about working with our community to build the best mobile eCommerce solution possible. If you have an idea for improvement or a feature, please visit our Ideas Board and submit it at: WooCommerce Ideas: Mobile App. Have a question before you download the free app? Please fill out this pre-sales form. Already downloaded and need some assistance? Get in touch with a Happiness Engineer via the Help Desk. I can log in, but no stores are found?